Your garage door is a major determining factor when it comes to the curb appeal of your home. Due to their position and size, it is usually the first things visitors, welcomed or otherwise, would encounter. Burglars would also notice your overhead door, and, depending on its condition, it could make your home seem as appealing as an easily accessible ruin or as intimidating as an implementable fortress. If your garage door is getting on in years, it could be time for a new one. Wood, aluminum or steel. These are the three most common materials used today. They each present a different set of benefits and disadvantages, so it's important to know what those are before making a decision. 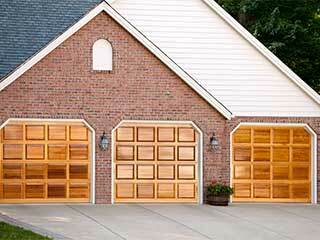 Wood has long been considered the classic look for a garage door to flaunt. It can truly improve the exterior aesthetics of your home and give it that desired appeal. However, this material requires a lot of maintenance in order to preserve its condition. Wood can warp or develop rot, and must be repainted annually in order to protect it from weather conditions. Metalic garage doors offer a lot of protection and security. Steel is very durable and sturdy, which means it will not damage easily and won't be easy to break through in order to gain entrance into your home. However, it can be susceptible to rust, which will greatly impact its capabilities. There are ways to resist rust, but they require regular maintenance, same as wood. This material has become quite common for good reason. Since it is very light and does not require a lot of maintenance, it can be a perfect choice for the budget conscious homeowner. However, aluminum doors will dent much more easily, and will not be suitable for areas where a lot of strong winds are prevalent. Although the material is one of the most important things to consider when getting a new garage door, it's by far not the only thing. Instead of wasting time and effort trying to figure out which system will be the best one for your specific needs, reach out to our experts at Garage Door Repair Jupiter. We'll happily consult you and perform the installation process once you've found the perfect overhead or roll up door for you. Feel free to call us if you need any repairs as well.